Last week we reviewed the ZAGG invisibleSHIELD for the Apple iPhone. And as we mentioned there, we highly recommend purchasing cases to protect expensive gadgets. But even with the best cases, there are a couple of drawbacks. These include reduced functionality, extra weight, and loss of the original design. An alternative option, that has become increasingly popular, is using Invisible Skinz. It’s a piece of durable, but barely noticeable film that safely adhere themselves to the device. The film will help ward off scratches and wear and tear. The best reward of using a skin instead of a hard case would be that the device would look just about the same as before adhering anything to it. 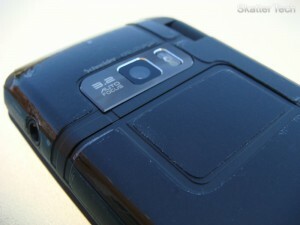 Getting the InvisibleSkinz film on the LG enV Touch isn’t a few minute job. It actually took us about 45 minutes to get everything installed properly. It comes with a few pieces of film, which was a bit of a puzzle to figure out which went where. 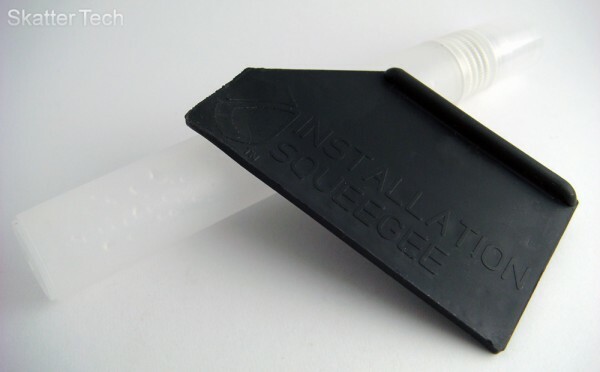 (15 included pieces) Installing it requires using a “SHIELDspray” liquid solution, to be applied to both your hands and the film. One thing that may worry many is actually getting this liquid all over your device. I can assure, after installing this type of product on many devices, that using a proper amount of solution won’t cause any issues. Just be sure to avoid getting any solutions into any critical openings. If the device is off and allowed to dry for a couple hours after installation, there’s nothing to worry about. Applying the film was pretty difficult, you only have a short window of time to get it adjust to the right spot. If there are any bubbles caught between the film and the body of the phone, just squeeze them out with the included tool. There’s also a ton of smears and small particles making the entire thing look horrible after you finish. However if you wait patiently overnight or a day, most of those work themselves out. The InvisibleSkinz for the LG enV Touch offers an extraordinary amount of coverage. There are pieces for both displays, the sides of the phone, and the back. There’s not too much that’s left exposed to be concerned about. The material is about .2mm thick, making it durable enough to protect against even deep scratches. The material won’t start peeling off as you probably would see with other over the counter protective films. There was no aspect of my device that lost functionality after applying the screen protector and rear protective film. The headphone jack and charger port are completely left open for easy access. The touch screen display lost a small amount of sensitivity, however it’s well worth the trade off than having a nasty scratch. It should fit into any cases you may own as well. It’s truly difficult to tell whether there’s anything even applied to the device with a quick glance. And that’s a good thing! 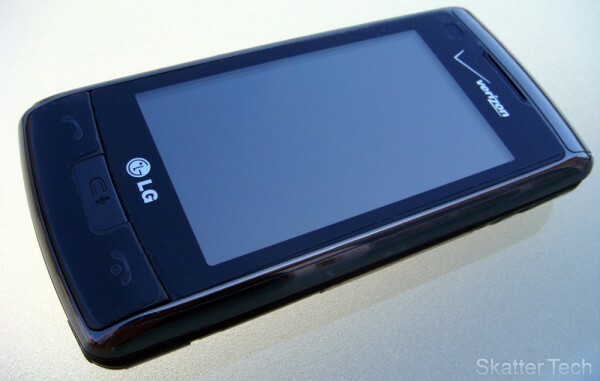 It keeps all the original elements of the design of the LG enV Touch. Only after inspecting it for a second or two would you realize that there’s actually something protecting the device. There’s no noticeable bulk or weight that would be an issue. The phone feels just as it did without it. InvisibleSkinz is actually an authorized retailer of ZAGG’s invisibleSHIELD. The item in this review would be the same item if purchased directly from ZAGG. Therefore the same warranty that ZAGG provides still applies. If you dissatisfied you can return it for a full refund in the first 30 days. If it gets scratched, torn, or damaged it has a life time warranty. All you have to do is mail it back to ZAGG in an envelope. They will send out a replacement at no cost. You can read Skatter Tech’s review of the ZAGG invisibleSHIELD for the iPhone 3GS for more info on our successful attempt to use the warranty. 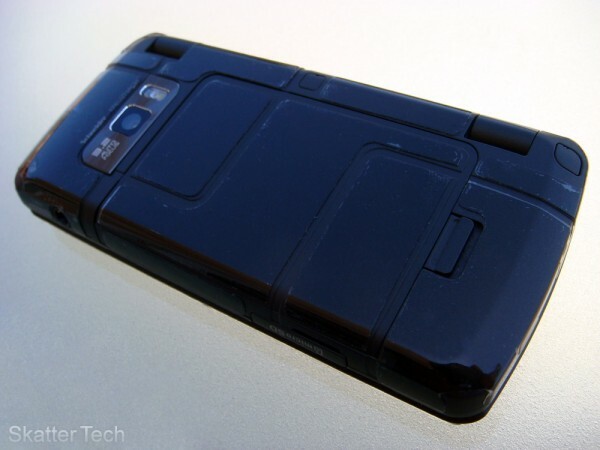 The InvisibleSkinz protective film for the LG enV Touch by ZAGG deserves a worthy mention. It’s well worth the investment for what it will do for your device in the long run. Keep in mind although this defends against scratches, it isn’t truly a replacement for what a case can do. A case can protect against physical damage such as a drop, which the protective film can not do. The best solution would be both the film and a case to truly prevent damage. 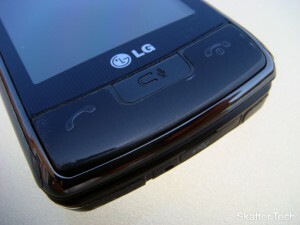 If you wish to buy the InvisibleSkinz for your LG enV Touch, it’s available for purchase online today. Readers of Skatter Tech are eligible for a special 15% discount. That brings the price down to just $21 from the original $25. To redeem the offer, just key in the coupon code ‘21849’ (without quotes) while proceeding through checkout.